ලෝකයේ බහුලතම භාවිතාවන ක්‍රමය මෙය වන අතර මෙවැනි දෙයක් නිර්මාණයට හේතු පාදක වුයේ මෘදුකාංග නිර්මාණ කරුවන්ට අවශයවුවා එක් ස්ථානයක ඇති Application එකක් Client ලා ගොඩකට එකවර Access කිරිමේ හැකියාව ලබාදිමටය.නමුත් එ සදහා 2-Tier System එක සුදුසු වුවද Application එකේ මතු පැවත්ම උදෙසා එ සදහා 3-Tier System යොදාගන්නා ලදි.1-Tier System එකේ ලොකු දුර්වලතාවයක් වුයේ Clients ගොඩකට එක වර Access කිරිමේ නොහැකියාව හා යාවත්කාලින කිරිම් වලදි Clients හට Developer සොයා යැම හෝ වෙන අයුරකින් Download කර Install කිරිම වගේ දෙවල්ය..
ක්‍රියාවලියෙදි Developers හට ගැටලු රැසකට මුහුන පැමට සිදුවිය..
නමුත් මෙමෙ 3-Tier System ක්‍රියාවලියෙදි Developers හා Clients හට එසේ ගැටලු සිදුනොවුන තරම්ය..
මෙහි Database Tier එක භාවිතා කරනුයේ අපගේ Application එකට අවශ්‍ය Database එක පවත්වාගෙන යැමටය..මෙම database එක ORACLE,MySQL,MSSQL..etc විය හැකිය. 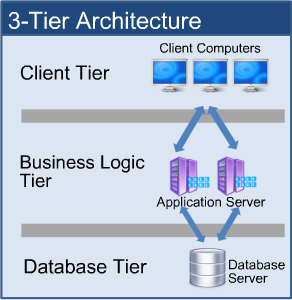 මෙම Database tier එක Middle tier එකට සම්බන්ධ කිරීමට බොහෝවිට XML යොදා ගනී. මෙය Client භාවිතා කරන interface එක වේ,මෙය implement කිරීමට C#,Java,HTML,Asp.Net,Python, වැනි මෘදුකාංග භාවිතා කරන අතර මෙම Client application එක Middle tier එකට සම්බන්ධ කිරීමට HTTP request යොදා ගනී.